A summary is presented of original data on the thermodynamics of the formation of copper(II) ion complex with glycyl–glycyl–glycine, the acid–base equilibria of glycyl–glycyl–glycine in aqueous–organic solvents, and published sources that reflect the effect the concentration of the organic cosolvent has on the stability of the coordination compounds of amino acids and peptides with d metal ions and the enthalpies of their formation. Analysis of the solvation characteristics of the reagents shows that upon moving from water to water–ethanol and water–dimethylsulfoxide solvents, the copper(II) complexes with a glycyl–glycyl–glycine zwitterion and a glycinate ion are mainly strengthened through the resolvation of ligands, which is characteristic of the formation of ionic complexes of d metals in aqueous–organic solvents. 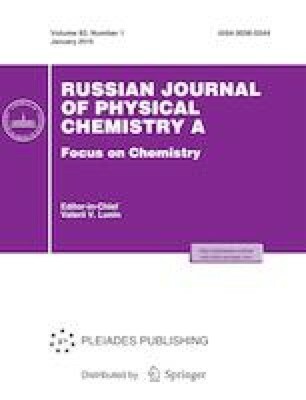 This work was performed on equipment at the shared resource center of the Institute of Thermodynamics and Kinetics of Chemical Processes, Ivanovo State University of Chemistry and Technology.